We’ve been as busy as ever with the two Lukes (more next time), the kitchen team and Ali in the butchery getting the creative juices flowing. 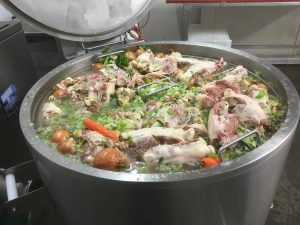 Our new stock pan, all 300 litres of it, is simmering away, making our wonderfully nourishing stocks and broths.It’s electric rather than gas so we can leave it gently simmering through the night for a genuine 24 hour broth. That and a little cider vinegar should insure maximum extraction. 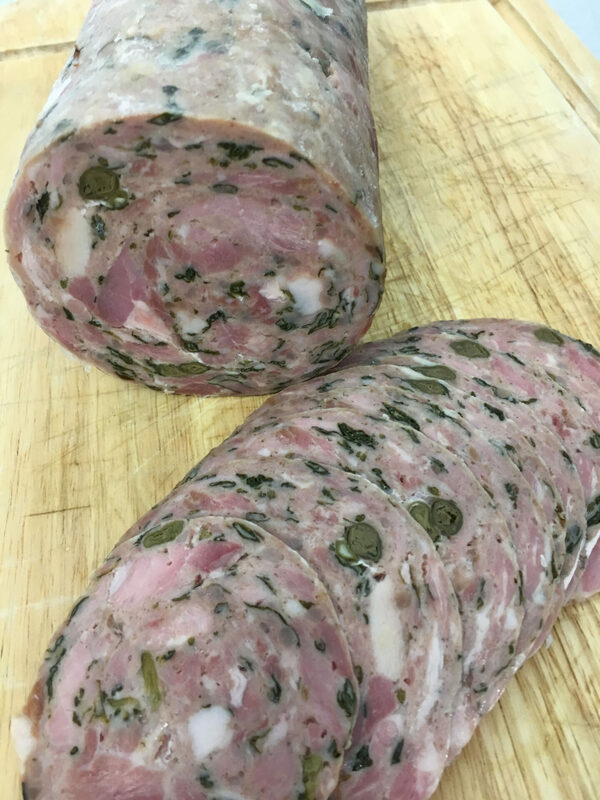 Post Christmas we always have loads of gammon off cuts in the freezer so we’ve added parsley, mustard and capers, put it in a large sausage casing and called it, rather pretentiously, Jambon Persillé, after the classic Burgundian pressed ham dish. Luncheon meat or Spam might be closer to the truth but it tastes a lot better than any cooked and tinned meat I’ve ever had. 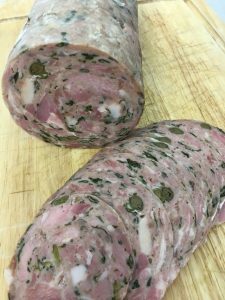 I think it’s really, pretty good – with a bit more grain mustard in a sandwich. Cakes are also back with a vengeance. 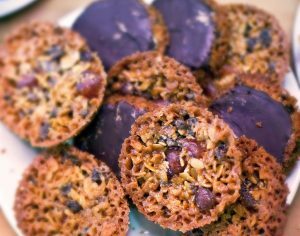 Gingerbread biscuits, Florentines, small trays of chocolate brownies and lemon and orange polenta cakes are back on the production schedule and there are more to come. Apologies for their long absence. Hopefully, Portuguese custard tarts will be next on the menu. We’ve also started baking bit of bread again. My quest for the perfect vehicle for dip dunking for the Tapas bar led me to toasted slices of focaccia. A few loaves down the line and an aching wrist and I thought I’d try it on the ham slicer (well cleaned of course). It worked a treat and they’re served with pretty much everything in BW&T. Once we’ve worked out right toasting time they’ll be available in the shops but in the meantime try slicing and toasting Baker Toms Foccacia. For dipping in hummus, it beats flatbreads, biscuits and breadsticks hands down. Ours will be better!